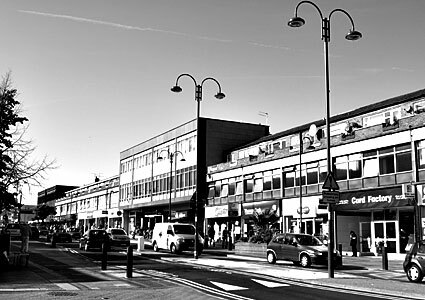 Borehamwood stands some 16 miles/25km north of London and was part of the ancient parish of Elstree. Its been hit pretty hard by modern development with just about all the character squeezed out of Shenley Rd, its main shopping street. A new Borehamwood Shopping Park stands just to the north of Shenley Road but we guessed it was going to be a disappointing experience so we gave it a miss and headed off on our 12 mile walk (The walk should have been around 10 miles, but we took a few wrong turns in our search for a bus home). 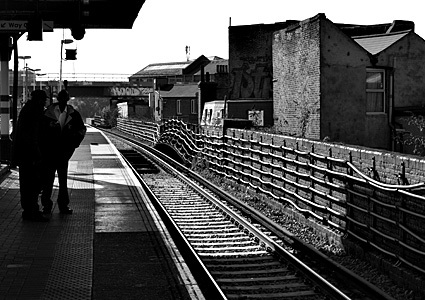 Waiting for the train, Loughborough Junction, south London. 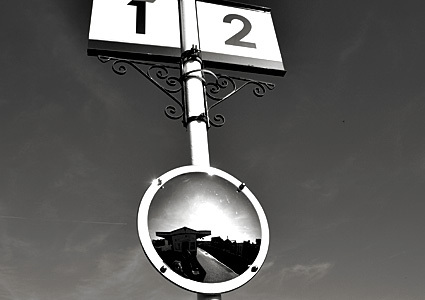 The train from Loughborough Junction (east Brixton) conveniently goes straight to Elstree & Borehamwood railway station. It's not the most photogenic of journeys though. 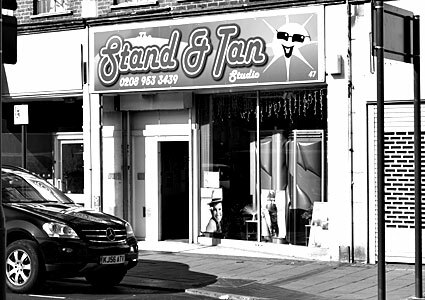 Pale-faced visitors to Borehamwood can enjoy a session at the alluring Stand & Tan Studio on Shenley Rd. 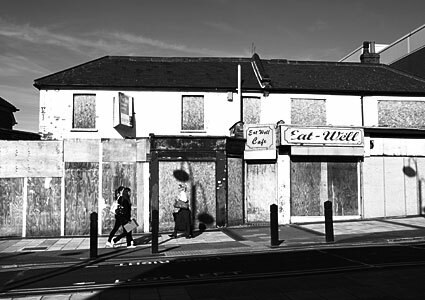 No more hungry customers for the 'Eat Well Cafe' on Shenley Rd. 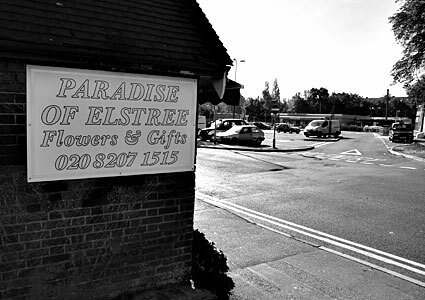 Edwin Nelken, chairman of Hertsmere's Chamber of Trade, said: "The large multinational organisations are bullying the council to get their own way by bending the rules to suit themselves and ignoring or overriding the regulations, with their financial backing which the council cannot or will not compete with. "It is a shame we don't have a council with the guts to stand up for what is right and avoid the total destruction and individuality of our high street." 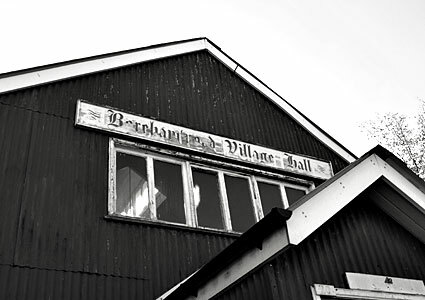 The faded sign of the 1920 Borehamwood Village Hall, built adjacent to All Saints Church which was consecrated ten years earlier. 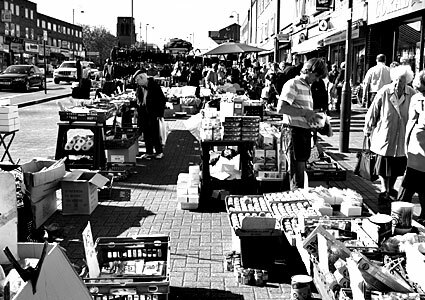 A view of the Shenley Rd street market which takes place twice weekly on Tuesdays and Saturdays. There's not a lot to get excited about here unfortunately, with the stalls knocking out the same old tat you can find in a hundreds others markets all over the UK. 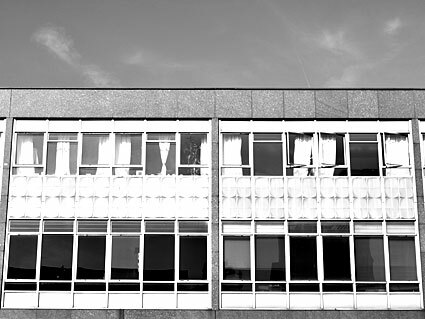 I bet it looked great on the architect's board back in the 60s but it just looks bland and anonymous to our eyes. Whatever happened to the local architecture? 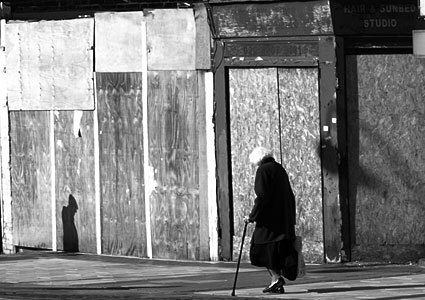 Old lady passes closed shops.